In an affidavit filed before the Supreme Court, the Jammu and Kashmir High Court Bar Association has vehemently asserted that it did not threaten Ms. Deepika Singh Rajawat, the Counsel appearing before the Jammu and Kashmir High Court on behalf of the victim's family. The Affidavit begins by tracing the history of the Association and asserts that it is not just a body of lawyers, but a body of responsible citizens whose duty was to fight the "break-India and anti-national forces". It then denies having threatened Ms. Rajawat, who had complained to Acting Chief Justice of the Jammu & Kashmir High Court Justice Ramalingam Sudhakar earlier this month, alleging that the Association's President, Senior Advocate B.S. Slathia and other office bearers had threatened her from appearing on behalf of the victim's family. The affidavit highlights discrepancies in her assertions, submitting, “...Smt. Deepika Singh Rajawat Advocate made a complaint to Hon'ble Chief Justice (Acting) on 09.04.2018 with regard to alleged threat by president J&K High Court Bar Association, Jammu as is evident from affidavit of Hon'ble High Court of Jammu and Kashmir. Besides, the Association also denied claims of having obstructed the Police from filing the chargesheet in the matter before the Magistrate. The lawyers had allegedly "taken pride" in mobilizing to prevent the police team from presenting the accused before the magistrate, even physically blocking their way. The President of the Kathua Bar Association had also passed a resolution to keep work under suspension until April 12, while also calling for and supporting a complete Kathua and J&K bandh on April 11. It now claims that the people of Jammu had "voluntarily and peacefully supported the Bandh", and that no untoward incident was reported from anywhere. 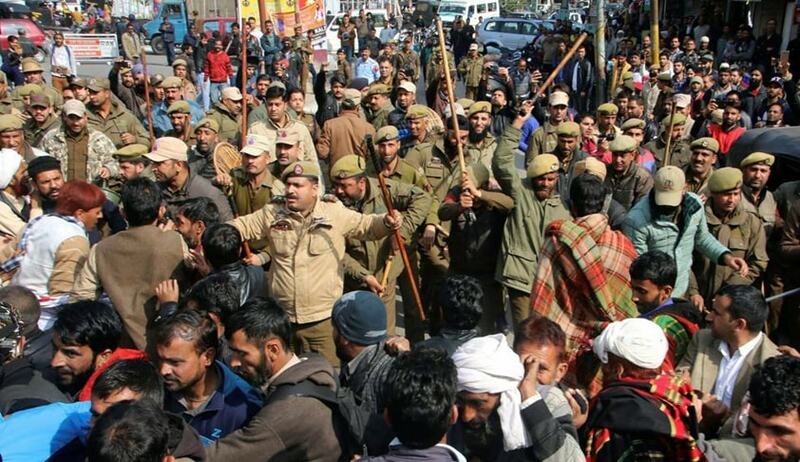 In fact, it asserts that protests were happening in Jammu, while the chargesheet was being filed about 100kms away from the points of demonstrations. The Affidavit then goes on to blame the media for making it look like the Association was preventing the Police from filing the chargesheet, submitting, "Unfortunate as it is, few irresponsible National News Channels and some section of the society hatched a conspiracy and launched a vilification campaign to injure the age-old reputation of J&K High Court Bar Association Jammu which is known for its secular/National credentials that the office bearers of the Association have caused obstruction in filing the charge-sheet in the Court–which is factually incorrect and emphatically denied." It, however, maintained that "justice shall be done to the victim only after a fair and impartial probe by the CBI". It, in fact, claimed that their apprehensions about the investigation were shared by the victim's family as well, submitting, "…the victim family also approached the Hon’ble High Court of J&K vide OWP No. 259/2018 titled Mohd. Akhter V/s State and Other through its Learned Counsel Smt. Deepika Singh Rajawat wherein the petitioner alleged that the police agency was not conducting the investigation fairly and the petitioner also alleged dissatisfaction with the Crime Branch, besides, the people of Hiranagar/Kathua were also not satisfied with the Crime Branch Investigation." The affidavit further highlights the fact that after the Supreme Court took up the case, it resumed work. These submissions, it also said, have been placed before the committee constituted by the Bar Council of India (BCI) after nation-wide condemnation of lawyers of the State for their alleged actions. In January this year, an eight-year-old girl belonging to Bakarwal-Gujjar community was abducted, raped and murdered in Rassana village in Hiranagar tehsil of Kathua district. Her body was recovered from Rassana forest in Kathua on 17 January, a week after she went missing while grazing horses in the forest area. The available evidence suggests that she was brutally gang-raped before being murdered. According to a report in The Print, a post-mortem report indicated damage to the girl's uterus and death due to asphyxiation. According to another report, Sanji Ram, a retired official of the revenue department is believed to have masterminded the heinous crime as a part of a broader conspiracy to create fear among the nomad 'Bakarwal' (goatherd) community in the village, so that they could be pushed out. Sanji Ram is, in fact, the custodian of the temple where the girl was allegedly held in captivity. The Police has, so far, arrested nine accused, including Ram and his son, a police head constable, two special police officers (SPOs) and a sub-inspector of police.